AIDSS is a non-governmental organization located in Togo, in western Africa. 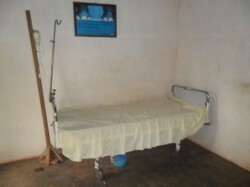 The mission of AIDSS is to concentrate efforts on aiding the psychological, social and medical health of HIV/AIDS patients and those affected by the disease in Togo. AIDSS is working to end the stigmatization and discrimination of persons living with HIV/AIDS by promoting an open-door policy to give patients a safe, private clinic for testing, treatment and advice. The AIDSS center in Tsevie, Togo is treating more than 200 adult patients and an additional 370+ orphaned and vulnerable children. Patients are provided with free anti-retroviral drugs, nutritional packets and psychological counseling on a consistent basis. The center also offers low-cost diagnostics and treatment for non-terminal diseases such as opportunistic infections and STDs. Additionally, AIDSS focuses on outreach to middle schools throughout 18 target villages surrounding Tsevie in order to promote understanding of the disease and prevent prejudice. 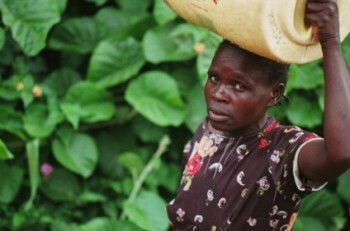 The organization’s goals for 2012 include: improving the ability to provide advice and treatment outside of the center, namely through home visits; to implement Moringa powder into their nutritional kits since the powder is a no-cost nutritional supplement high in iron, potassium, calcium, vitamins A and C, and protein; and to successfully construct a cistern for its Tsevie Center. 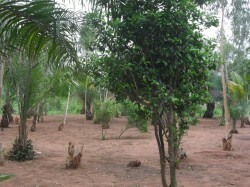 AIDSS has already planted 100 Moringa trees on its premises. However, Do Good Lab is partnering with AIDSS in the construction of its desperately needed cistern. 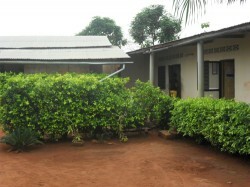 The cistern will collect rainwater from the Tsevie Center’s roof. An on-site water source will greatly contribute to the sanitary and hygienic needs of the center staff and beneficiaries. Since 2007, the staff has had to transport water from city water sources. The anticipated cost of the cistern construction is $8,000 USD. In 2002, the Togolese government finally started changing its attitude toward HIV/Aids. Before 2002, they affirmed that it didn’t exist. By 2005, the government took over all financial responsibility for dispersing ARVs (the Togolese government is currently funded by the Global Fund for this endeavor). 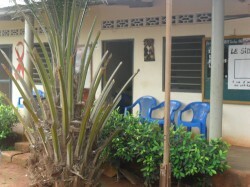 In 2005, Clement Agbodji came to the village where the AIDSS Center is located. When he arrived, he met the husband of the 4 women in this video. Clement suspected that the husband had many opportunistic infections. The husband had open blisters on his skin – indicating that the degree of the disease had advanced. The husband was a sorcerer and voodoo healer who believed that he had performed an ineffective treatment for someone. Since he wasn’t able to heal that person, he then contracted the disease (sorcery and supernatural beliefs are prevalent in the understanding of HIV/Aids in Togo and Western Africa). The husband tried to treat the disease through natural, holistic medicines but they weren’t enough. After the husband died, Clement convinced the 4 women to get tested. Initially, only 2 of the wives would be tested. Though, 1 year later the others followed. All of the women tested positive. The family of this holistic healer consists of 4 wives and 11 children. Only 1 child tested positive and subsequently passed away a few years ago. In polygamist families, the last wife continues to have sexual relations with the husband, and in this case it was the last wife whose child passed away. Thankfully, these four women remain healthy and have been receiving treatment and ARVs from AIDSS since 2005. Posted by Kathrin on Wednesday, April 11th, 2012 at 8:37 am.